Counters and kiosks are a good choice when space is limited. 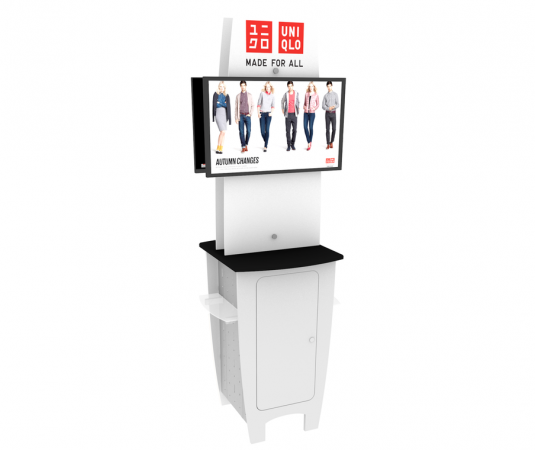 Apple Rock counters and kiosks can provide both display and work space, and they can be configured with other elements as part of a larger display. Our counters and kiosks are custom fitted to you and can accomodate any technology you chose. Many of our counters and kiosks provide secure storage areas that are perfect for small products, sales literature and promotional materials. They can also be combined with other elements to be a complement to part of a larger tradeshow or promotional display. Talk with an Apple Rock consultant to find out how counters and kiosks can meet your trade show or event display needs.